Josef Kolbe’s two medal ribbon bars each hold nine ribbons, corresponding to the awards described in the previous pages (excluding the Jubilee Medal 1898) and six others, described below. 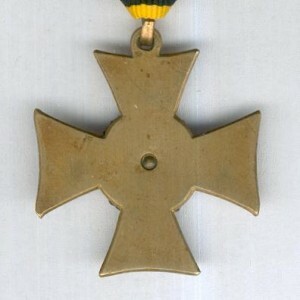 The three Military Merit ribbons all bear swords, which suggests that, for the Military Merit Cross and the bronze Military Merit Medal, they were added at a later date than the actual awards, following his actions in the field. 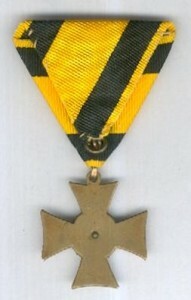 The design was based on the cross pattée depicted on the reverse of the Commemorative War Medal 1870-1871, which had been awarded for service during the Franco-Prussian War. The centrefield bore the dates 1914 1918 on two levels, surrounded by a wreath, which for combatants was a laurel wreath set on crossed swords and for non combatants and next-of-kin an oak wreath. 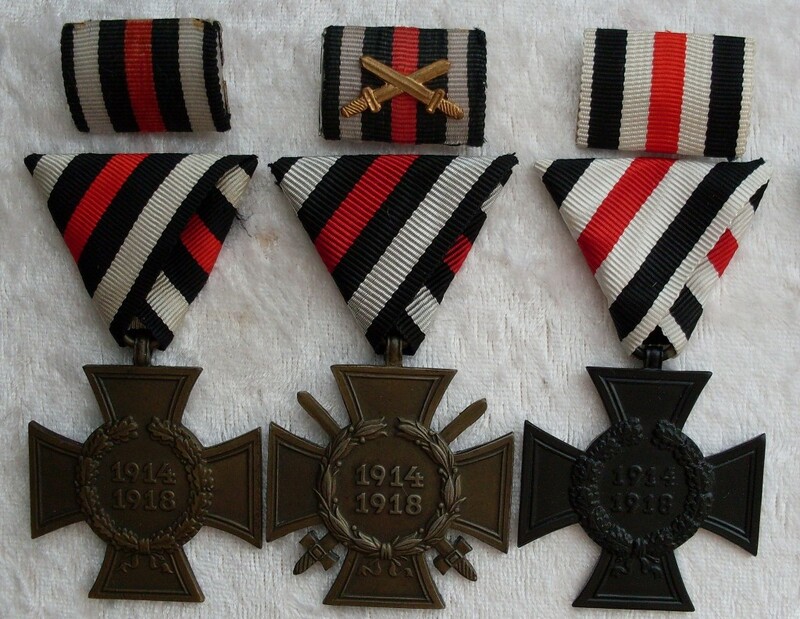 All three crosses were made of iron, the combatant’s and non-combatant’s having a bronze finish, whereas the so-called widow’s cross was varnished dull black. The reverse was blank except for the manufacturer’s initials. 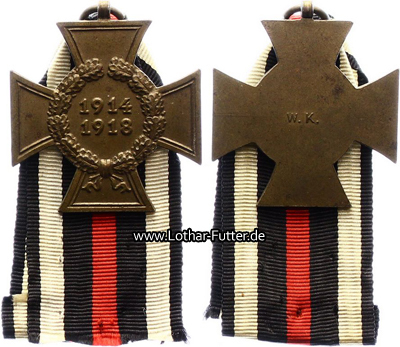 The Honour Cross was suspended from a tri-fold of black, white and red stripes which combatants and non-combatants wore on the left breast. The order of the stripes was reversed for the widow’s cross, which was frequently worn with the ribbon tied in a bow and pinned to the mother’s or widow’s clothing. 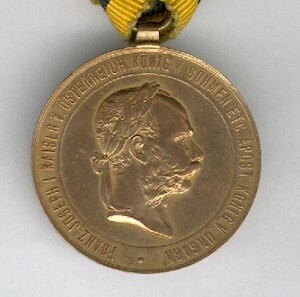 The War Medal 1873 was instituted on 2 December 1873 to commemorate the 25th Jubilee of Emperor Franz Josef’s accession to the throne. 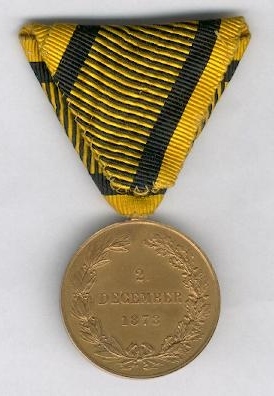 It was awarded to the members of the armed forces who had taken part in at least one campaign between 1848 and 1901, but was later extended to include all campaigns completed before the Emperor’s death in November 1916. 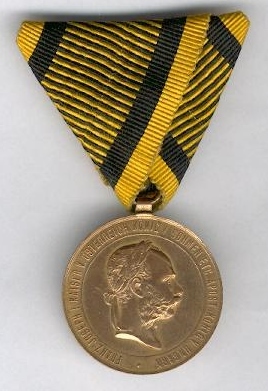 The medal was made out of the melted bronze from captured artillery and depicts on the obverse Franz Josef’s laurelled head in profile surrounded by the inscription FRANZ JOSEPH I. KAISER V. ÖSTERREICH, KÖNIG V. BÖHMEN ETC. APOST. KÖNIG V. UNGARN. 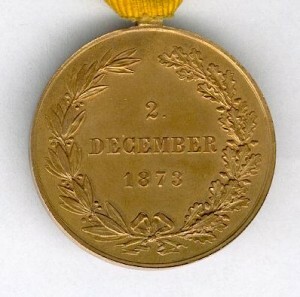 The reverse bears the date 2. DECEMBER 1873 (those with the spelling Dezember where produced after 1900), enclosed on the left by a laurel branch and on the right by an oak branch, attached at their base by a ribbon. It was suspended from a tri-fold with the Habsburg colours (yellow with a centre design of black and yellow horizontal stripes bordered by two black vertical stripes) and was worn on the left breast. 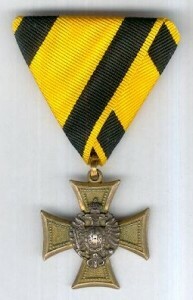 The decoration took the form of a gilt bronze cross pattée with, on the obverse, black borders for the 1st and 2nd classes and beaded borders for the 3rd. The 1st class cross had the added distinction of being surmounted by the imperial crown out of which flowed a sash. The centrefield originally depicted the Austrian coat of arms, but this was amended in 1867 to show the arms of the Dual Monarchy of Austria-Hungary. The reverse was blank. The crosses of all classes were suspended from a yellow ribbon with black outer stripes. 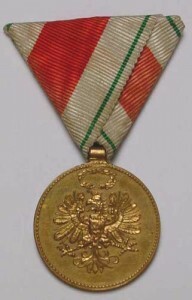 A revision of the award qualifications took place in 1890, which probably meant that Josef Kolbe was able to receive his, as his service fell short of 25 years. 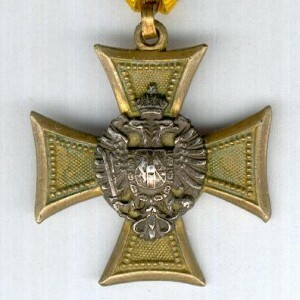 The Long Service Cross continued to be awarded until the dissolution of the Austro-Hungarian Empire in 1918. 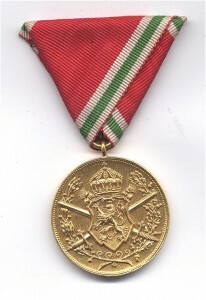 Tyrol Commemorative Coin 1914-1918: For the Tyrolese who took part in the war and the defenders of Tyrol. 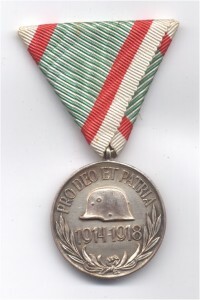 Hungarian Commemorative Medal 1914-1918: For those who served on the front. 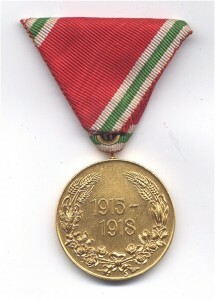 Bulgarian Honour Medal 1915-1918: For combatants during the Balkan war. 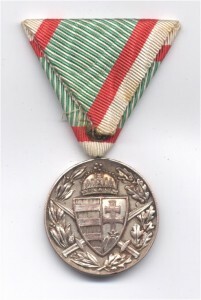 Hungarian Commemorative Medal 1914-1918, obverse? 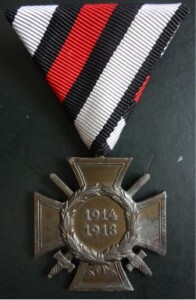 Hungarian Commemorative Medal 1914-1918, reverse? 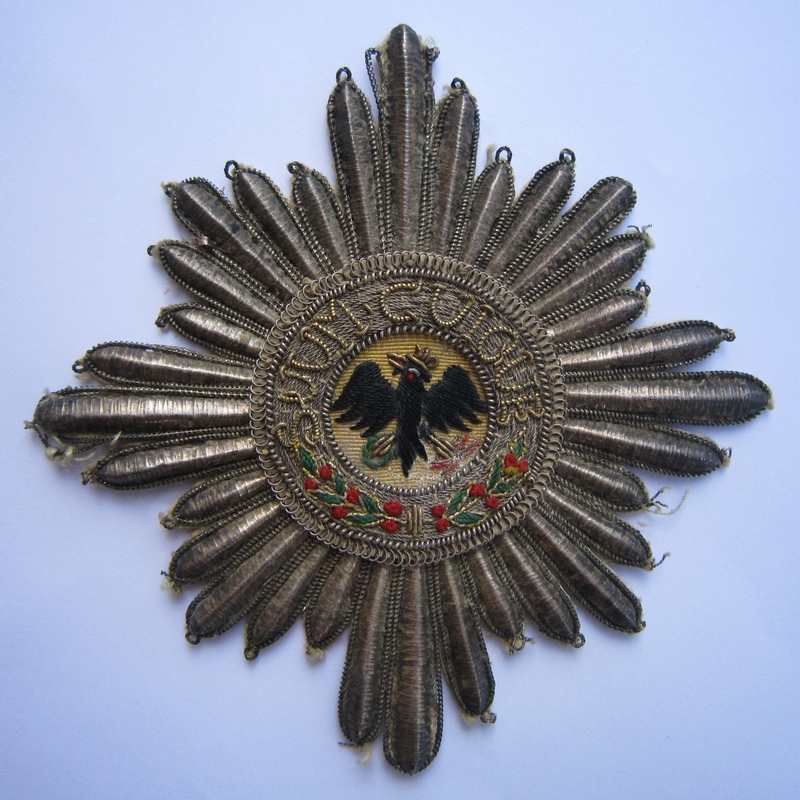 The Order of the Black Eagle was the Kingdom of Prussia’s highest order of chivalry. It was instituted on 17 January 1701 by Elector Frederick III of Brandenburg, who was crowned King Frederick I of Prussia on the following day. It was awarded to members of the Prussian royal family, princely German families and European reigning houses, together with nobles and those who were raised to the nobility through the award. I make no pretence that Josef Kolbe received the award, but this fine example of the embroidered version was among his few remaining possessions.